It is definitely that time of year when our schedules fill up with Holiday Parties. Whether or not you are hosting or just contributing to the menu, we need food that is dressed to impress. 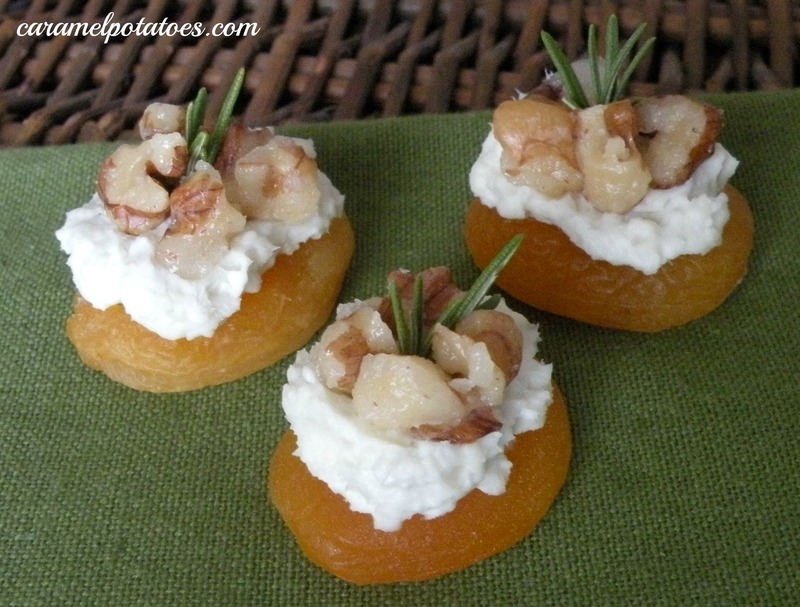 These bite size appetizers are sweet and savory; creamy and crunchy. These little gems will be a hit where ever they are served. In a small skillet, melt butter over medium heat. Add walnuts and sugar; cook and stir for 2 to 3 minutes or until walnuts are lightly toasted. Stir in 1/2 teaspoon fresh or 1/4 teaspoon dried rosemary; cook and stir for 30 seconds more. Transfer nuts to a foil-lined baking sheet; cool. Meanwhile, in a small bowl, combine Gorgonzola cheese and cream cheese. Beat with an electric mixer on medium speed until smooth. Spoon about 3/4 teaspoon of the cheese mixture on top of each dried apricot. Sprinkle with nuts. If desired, garnish with additional fresh rosemary. Hi- these sound delicious! Does anyone know how far on advance these can be made?